Seasons Greetings from our new west coast base of operations.! After selling the house on December 15th, we officially moved from Minnesota back to Oregon on December 18th (thankfully just ahead of the blizzard that shut down Denver International Airport). It's so great to be back. Already we've had the chance to spend casual hang out time with different family members, so different from the frenetic must-see-everybody-and-make-it-special feeling of quick and infrequent visits. We're looking forward to years more of that as we settle down into the fabric of family. 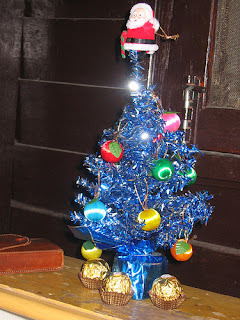 Last Christmas eve found us sitting in a dimly lit hostel room in Chiang Mai, Thailand clustered around a blue and white tinsel tree (to celebrate both Hannukah and Christmas). Christmas Day we spent in the first of a four day Thai food cooking seminar. Between then and now we've had more experiences than we can even process: travels through Laos, Cambodia, Vietnam, China, Hong Kong, New Zealand, Australia, and Fiji; reunions with family and friends up the west coast and in Minnesota; facing the reality of a cold housing market and choosing what was important to us (getting back to our family and getting closer to starting our family) over financial considerations; starting to work again in the same environment that led us to drop everything and leave and learning to control my hours and still prioritize my life, selling the house and moving cross-country; and gearing up for new jobs, a new home, and in Brian's case, a new graduate degree program here in Oregon. That's a lot of life. But the constant through all of it, the thing that gave us strength and made us feel rich on a daily basis, was the presence in our hearts and minds of all of you. We are so tremendously blessed in our friends and family, whether they be people who have known us all our lives or those of you who we have met along our travels. THANK YOU, thank you for your friendship, love and support. We wish you all a year of health and happiness, friends and family, joy and laughter. Thanks, you are welcome, and good luck with your projects back in Oregon ! Can your dreams be carried out!!! We took much pleasure to visit at the same time as you our beautiful planet ground and today we are sure that nourishes of all these experiences, you are ready to start this other beautiful adventure of the life which awaits you!!! Still and still, the best for 2007: health, friendships, babys, house, success in the studies and a little, but not too much, work!!! We kiss you very extremely and hope to have the occasion to see you again in this new adventure!! !